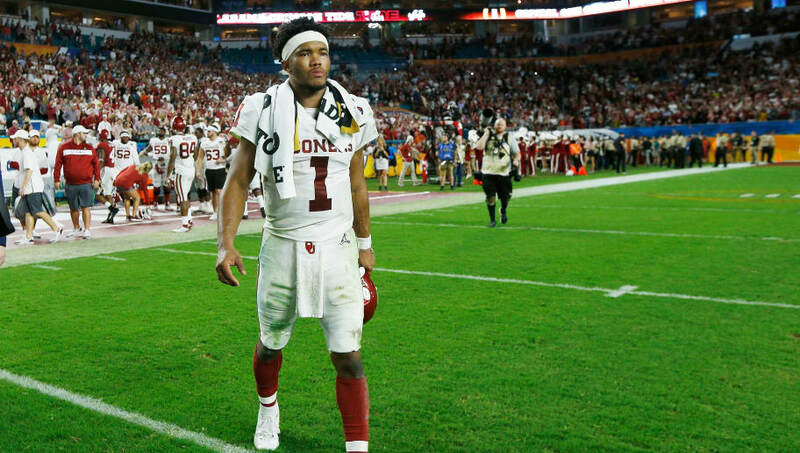 ​Well, looks like we finally have our answer on what the future holds for Kyler Murray. After a remarkable season, which ended with a ​Heisman Trophy and trip to the College Football Playoff, fans were begging the star quarterback to keep on playing football. He's headed in that direction. The San Francisco Chronicle's Susan Slusser is reporting the Oakland Athletics, who used a first-round pick on Murray in the MLB Draft last year, are expecting the ​Oklahoma Sooner to enter the NFL Draft. Murray was taken No. 9 overall in last year's MLB Draft, but Oakland allowed him to return to Oklahoma to play another season of football. That decision proved to be life-changing for Murray, as he BLEW up this year and was awarded the Heisman Trophy. Earlier on Wednesday, reports surfaced stating Murray won't be playing both football and baseball after his college days come to an end. Now, it's looking like the dual-threat signal caller has the gridiron on his mind. Text from a G.M. on Kyler Murray: He'll be a first-round pick. Murray threw for 4,361 yards and 42 touchdowns this season, while adding 1,001 yards and 12 more scores on the ground. Yup, those are the numbers of a first-round pick. Last June, Murray agreed to a deal that would give him nearly $5 million from the A's as a signing bonus. The club was hopeful he'd have a bright future in the AL West, but things have now changed. Instead, NFL GMs will be doing their homework to decide if they want to draft him come April.